The New Museum is in one of the museum buildings built by the GDR in 1959/60 on top of the foundations of the SS garages in the former commandant’s office section. The original museum was opened in 1961 as the “Museum of the European People’s Antifascist Struggle for Freedom” with the inauguration of the memorial site. After the renovation work was completed on the New Museum under the direction of the Frankfurt architecture firm Braun & Voigt while they were in the process of redesigning the memorial site, it was possible to show the newly designed 600 sqm museum space to the public: The left wing was re-opened on June 9, 2002. The content of the exhibition had also been redesigned; including two new permanent exhibitions about the entire history of the Sachsenhausen Concentration Camp, including its usage after the war, as well as the history of the Soviet Special Camp. 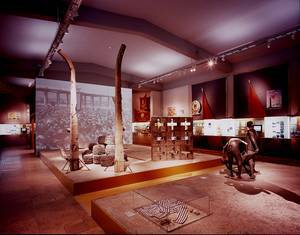 For the first time, the 2002 permanent exhibition also documents the time period between the inauguration of the memorial site in 1961 and the end of the GDR era in 1990. The first beginnings of any memorial work after 1945 outside of the former concentration camp area are presented here, as well as the neglect and destruction of the site starting in 1950 after the Soviet Special Camp was closed and the usage of the camp by the “Barracked People’s Police” and the controversial handling of the place of remembrance. When the Central Committee of the Socialist Unity Party of Germany (SED) decided to build three national memorial sites in 1953, a board of trustees was appointed for Sachsenhausen called the “Buchenwald Collective”. They reduced the entire memorial site complex to include only the inner camp triangle, declared themselves in favour of a consistent artistic design of the memorial site and arranged for the almost complete demolition of the remaining original buildings. Using photos, maps, artistic studies and designer’s blueprints, drafts, models, works of art, posters, cut outs from old GDR and FRG newsreels as well as numerous objects, the exhibition demonstrates the way in which the historical location was extensively modified and covered up by GDR architects and designers. The exhibition also provides information about important aspects of the politically exploited antifascism. The GDR state leadership used the opening of the Sachsenhausen National Memorial Site on April 23, 1961 in order to demonstrate the government’s antifascist doctrine for domestic and foreign policy purposes. In the last chapter, “The Monument Is Crumbling” (“Das Monument bröckelt”) the subtle undermining of the state’s co-opting of the memorial site is shown. Members of the peace movement, church movement and citizen movements, as well as the “excluded victims” are presented here. All of them attacked the communist “hero monopoly” and publicly claimed the Memorial Site. The gradual structural deterioration of the memorial sites in the GDR also becomes obvious here. The presentation is structured into five thematic focuses which are illustrated using key exhibits. The main exhibit and thus the ideal exhibition building is the museum itself, since it was a part of the GDR exhibition site and the museum core of the memorial site at the same time. The architect Stefan Haslbeck designed the exhibition with his team on this basis: They used a wall design, which contains glass display cases with three-dimensional exhibits, film presentations and audio examples, in order to highlight the thematic collection in an effective manner. The expressive, large-format exhibits are presented on a large concrete area and correspond to the respective focuses. For example, there is a bronze sculpture called “The Falling One” (“Stürzender”) and the model for the group of figures called “Pieta” at “Station Z” and the “Ernst Schneller Closet” (Ernst Schneller-Kabinett) which are placed in the centre of the exhibition room and determine the feel of the room.